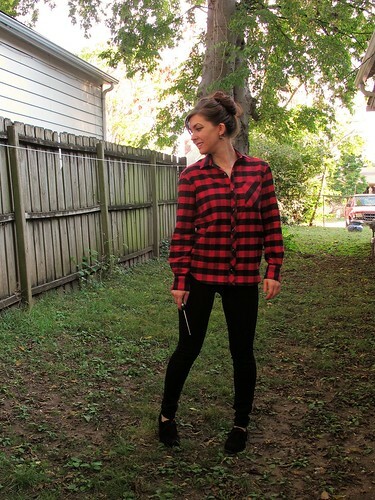 Home Pants	Cozy Plaid Flannel, Yeah! 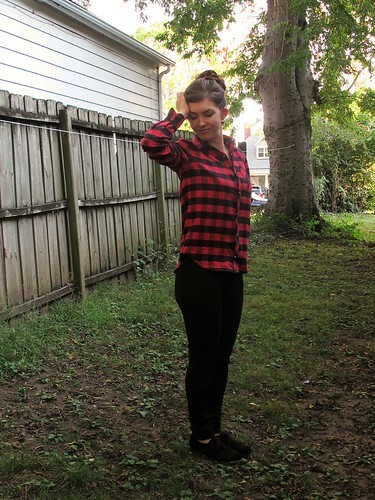 I’ve always loved the plaid flannel shirts that everyone wears when the temperatures start dropping, but the selection (at least where I live) has pretty much hovered around disappointing. 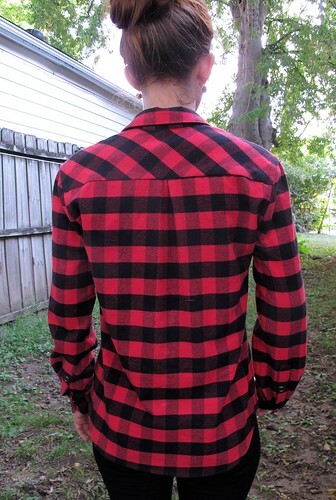 Ugly plaids, strange fiber contents, weird boxy fits—do not want! Which is why I took the initiative and made my own. LIKE A BOSS! 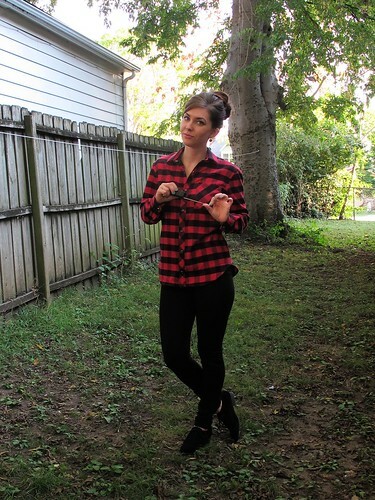 Seriously, though, have you seen the cotton flannels at Mood Fabrics lately? 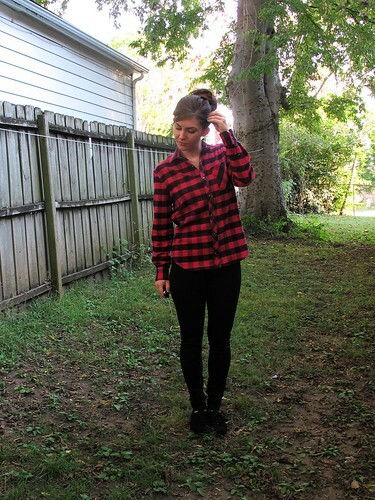 The red and black check I’m rocking here actually comes in five different colors—I mean, what better excuse do you need to wrap yourself in a cozy plaid cloud? Bonus—the loft of this fabric makes it really easy to sew because the pieces want to stick together. This also means that cutting is fairly easy. I always cut my plaids on a single layer and mirror the pieces to ensure that everything matches, so having a fabric that wants to “stick” means less shifting. It’s also not as prone to unraveling, so sewing fiddly details like the collar stand and sleeve plackets were not an issue —especially since the cotton presses so well. The only drawback is that it is REALLY hard to unpick your stitches if you make a mistake. Those lil guys just sink right into the fabric and it’s difficult to see them! 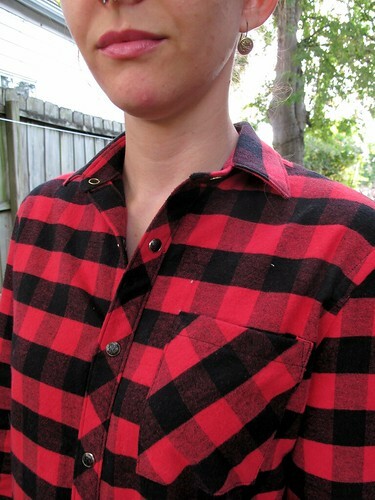 To make my lumberjack dream a reality, I used the Archer button-up pattern from Grainline Studios. I know, there have been a LOT of these here on the Mood Sewing Network—all for good reason, though. It’s a fabulous pattern! For my version, I turned the front button band and back yoke on the bias for visual interest, and paid extra special attention to match all the plaid elsewhere. The inside seams are all flat-felled (not OMGnecessary for a sturdy, non-ravely fabric like cotton flannel- but it sure looks nice!) and I changed out the buttons for pearl snaps. What can I say, I really love ripping my shirt off hulk-style when I walk in the door. You probably noticed that I put the button band on the wrong side of the shirt – the dude side, if you will. Whoops! Honestly, I painstakingly cut each piece correctly – but then later changed my mind on which side to use at the right side of the fabric (one side is a bit darker than the side you see; all the checks are just red and black, no grey). I didn’t even think about how it would affect the side of the buttons until I got to that point, and now here we are. Personally, I am just going to keep my head in the sand here and pretend like I’ve just stolen a man’s shirt. 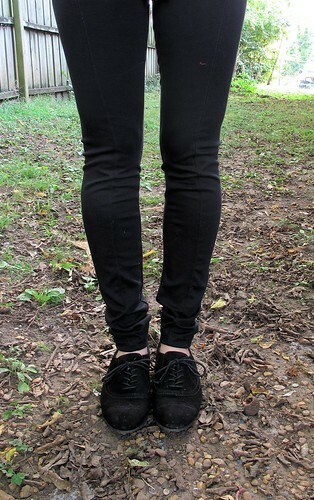 I also made my leggings, although they look pretty boring in most of the pictures I took! 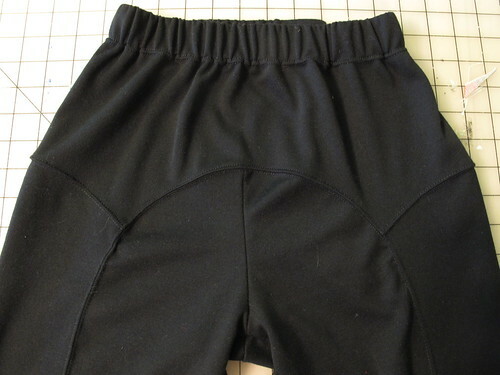 I used the Ooh La Leggings pattern from Papercut, and sewed them in this black ponte knit. I’m really happy with how they turned out —they are comfy as leggings should be, but the ponte is thick enough so that they actually look more like pants than tights. I love the cool seaming detail on these leggings, so it’s nice to be able to wear them with a shirt that actually shows the curved yoke and center seams. The only thing I will say about ponte leggings is that you may want to consider sizing up, especially if your ponte is on the less stretchy side. Mine are fine, but any tighter and I would have to dance to get them on! I never thought I would consider a flannel button-up to be an actual wardrobe staple, but let me tell you—the temperatures dropped quite a bit over the weekend, and I’ve been wearing this shirt nonstop. It’s so warm and cozy, but it looks so much classier than my bathrobe.